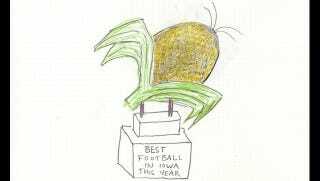 Now that the Iowa Corn Growers Association and the Iowa Corn Promotion Board have abandoned their ill-fated agrarian-robot-family-allegory design for the Cy-Hawk Trophy, how will the victors in the annual football showdown between Iowa and Iowa State know they've won? Please help bail out the corn industry by submitting your alternative trophy designs—corny, but not too corny—to tips@deadspin.com. Our panel of art experts will compile the best designs and put them up for a vote. Winner gets a very special Deadspin prize.